I held out reading Thomas Pynchon's latest novel for over a year. Against the Day's size, plus my doubts that he would ever contribute a music playlist to the Book Notes series on this site. Having read only Pynchon's Gravity's Rainbow in the past, I was unprepared for how much I enjoyed this novel. 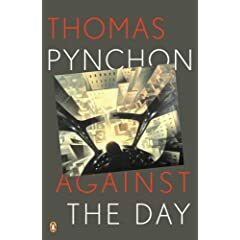 Pynchon's prose is sharp and the myriad of subplots that move this book forward (and even the ones that don't) make it one of the most involved, yet enjoyable books I have read in recent years. For two weeks, enter the coupon code "LHB001" at Atomic Books and receive 15% off this title. This wraps up the 2007 edition of 52 Books, 52 Weeks. Look for a new season to start on Saturday, I am hoping to make the series a weekly feature as I try and structure my recreational reading in the coming year.